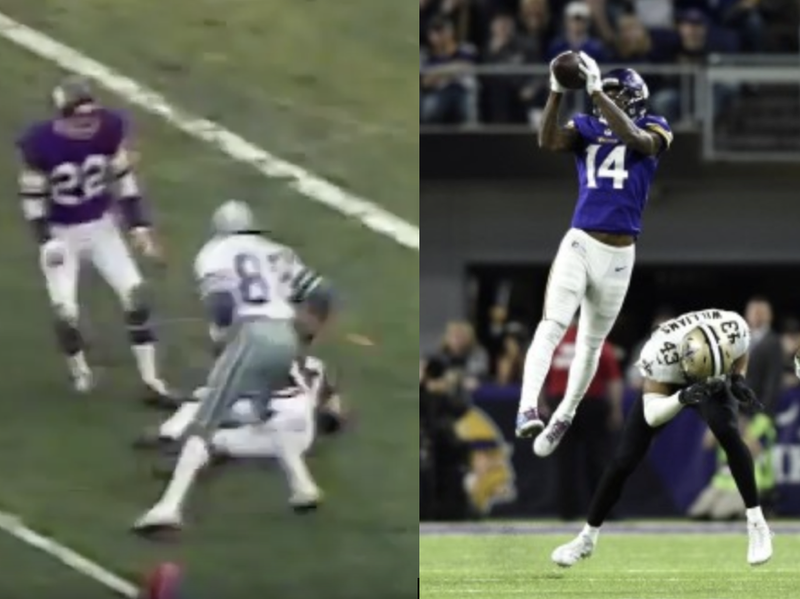 My first memory of football was the image on the left, in a divisional playoff game in Minneapolis that I watched on TV. The Dallas Cowboys beat the Minnesota Vikings on a last-minute pass from midfield, thus coining the term “Hail Mary.” If you’re wondering what the guy in purple is doing on the ground, he was pushed by the Cowboys’ Drew Pearson in a textbook example of a missed offensive pass interference call. In many ways, that game set the stage for my life as a Vikings’ fan, a sports nut, and a person. I don’t believe in jinxes, but the Vikings are oftentimes called cursed. Losers of 4 Super Bowls in the 70s and their last two NFC Championship games (in overtime, for good measure). In sum, often good, but never good enough to win the big one. I grew up in Canada’s oil country. The Vikings played in the snow, just like my buddies and me — and they were as close as any NFL franchise to Calgary — so that became my team. Work transfers between Texas and Alberta were common. My Dad and I went over to a colleague’s house to watch the game. I don’t recall much, except the joy of a near-win turn in an instant to the shock of a loss. I don’t recall his friend’s reaction — it could have simply been jubilation — but as I choked back tears, it felt a lot like gloating. Fast-forward to last night. The picture on the right. The miracle 61-yard TD catch on the last play of the game. Not just because my team, for once, came out on the winning end of a dramatic game, but because it reminds me how sports are metaphors for life, with nearly every theme and lesson buried in the storylines. Here’s what I’ve learned — and how it relates to last night’s game. · Play hard, but play fair. Lost in all the talk about last night’s game is that the Vikings avenged their 2010 defeat in the NFC Championship game to New Orleans, the team that would win the Super Bowl two weeks later. Their coach, Sean Payton, missed the next season while serving a one-year suspension for his role in BountyGate, in which the team’s coaches rewarded players for injuring opponents. Hitting hard is critical to stop a guy from gaining yards — or to cause a fumble — but to deliberately hurt another human being is unforgiveable. · Be as gracious in victory as in defeat. Truth be told, I thought Stefon Diggs overdid his celebration a little. His words gave glory to God and his teammates, but he appeared to be grandstanding. Then again, there’s no handbook for celebrating an unprecedented play. The Saints were gracious in defeat, especially Marcus Williams, who accepted personal accountability for his mistake, a split-second decision that will live with him — and that he’ll learn from — forever. · Know that there’s a fine line between talent and luck. Don’t assume that all of your good fortune is attributable to you alone. The difference between championship winners and losers can be a field goal missed by inches. That’s it. The New England Patriots have won each of their 5 Super Bowls by a Field Goal, or an end-of-game miracle. Don’t believe all the narrative written post-facto. · Not all the breaks are going to go your way. In fact, very few of them might. You can complain about it, or accept it, while working hard to impact what you can control. · People are people. In a controversial year for the NFL, I challenge you to find anyone last night who saw the game in shades of black and white. We saw players, teammates, friends. We saw a team (and its fans) united in the thrill of victory, and another united in the agony of defeat (as that guy from ABC Sports used to say). A fitting reminder today, the day on which we celebrate Dr. Martin Luther King, Jr.
Advertising, marketing, biz dev executive. Lover of words and numbers. Sports nut. Singer and acoustic guitar guy in The Queen’s English, a dad band.